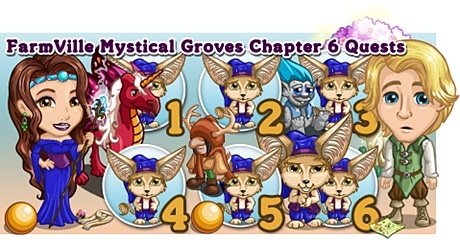 It looks like Renara is missing in FarmVille The Comfort of Night, a FarmVille Mystical Groves Chapter 6 Quests. Tattle is worried sick that she can’t find Renara while Merrick’s Kingdom is also in trouble for the Chancellor that he left in charge was gone missing also. And they will need our help for this troubles. On this chapter of Mystical Groves Quests, we will be needing to raise the Alchemists Shop recipe Saving Salve to level 3. It is a level 1 recipe so maybe as of now you have it to level 3. We will be also crafting Golem Stone in the Alchemists Shop and gonna make Melody Mix in the Apothecary. Note: Expected release date is on Oct 21, Monday. Info: Crafted at the Alchemist’s Shop and it will need Goldenseal Bushel x3, Flaxen Strawberry Bushel x3 and Zaffre Oats Bushel x3. Tip: Place and harvest the Fairfly Duck in an Aviary or Duck Pond. Info: Crafted for 12 hours each at the Apothecary and it will need Blue Bubble Brew x2 and Dream Draft x2. Info: Must be harvested atleast 5 times to reach level 1 star Mastery. Info: Must carft atleast 4 pcs of Saving Salve to raise it to level 3. Info: Golem Stone will need Blakk Root Bushel x3, Dusk Turnip Bushel x3 and Wan Raspberry Bushel x4. Is it Saving Salve or Soothing Salve? The words say Saving Salve. The ingredients are for Soothing Salve. Definitely Saving Salve, it would just be silly to have something that difficult for the first task. What level apothecary is soothing salve? You have the potion for the first part of the quest wrong. It’s not in the Apothecary. It’s in the Alchemist Shop. It requires 3 each of the following bushels, goldenseal, flaxen strawberry, and zaffre oats.